Udon Thani: Central Plaza to Vientiane Thai Consulate in 4 hours? I prefer to spend the night in Udon instead of Vientiane. So say I check out of a guesthouse near Central Plaza. Is there a shuttle to the border or will I need a tuk? I budget 1 hour to border, 2 hours checkpoints, 30 minutes border to Thai consulate. Say 4 hours with a 30 minute buffer. If I leave the guesthouse at 6am it shouldn't be an issue right? Google says the border opens at 6am and I'd expect to arrive at 7am. The link in the chain can be tuktuk. I got on one and seemed to pickup dropped of Thai along the way. The taxi can wait for others and waste time. Some other members will advise a better way. If I was doing it again might take private taxi from border to consulate. 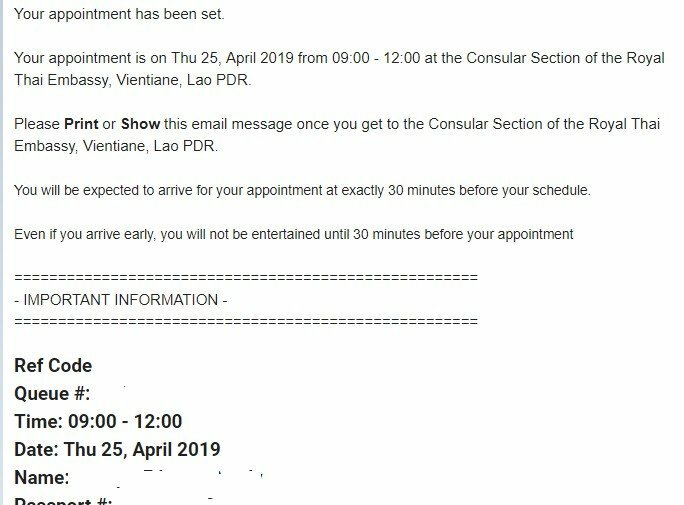 You do know you need an appointment now at Vientiane consulate. Yes I plan to book late to give myself a buffer 11am, maybe 12pm. If I cross the border 1-2 hours early I'll go to downtown first to setup my room. If you walk out of Central Plaza and turn left...walk to end of street...about 2 city blocks...there is a train station and train that goes to Nong Khai for about 30 baht...You can google the schedule or walk down there and check departure times. You will then need a tuk tuk to Friendship Bridge and immigration. I would not recommend doing this. If you miss your appointment for any reason, you won't get another one anytime soon as things stand now in Vientiane. Things can and do go wrong when traveling; spending an extra night in Vientiane gives you peace of mind. So now with a late appointment at say 11am, I think the risk would be quite small. 2.5 hours extra in case something goes wrong. At this time the appointment time is 9 to 12 and it still states to show up 30 minutes early. This from an email sent after making an appointment. Take a bus from Udon to Nonh Khai. There are some minibuses that go to the Friendship Bridge, but just getting to Nong Khai bus station is fine (if a Friendship Bridge minibus is not leaving soon) taking a tuk-tuk from the bus station to the bridge. Avoid the train as you cannot predict when it will turn up, and it is very slow. Usually, immigration, including the bridge crossing and Lao visa application, should not take much over an hour. It may be optimistic to assume 30 minutes to the consulate after clearing immigration (especially if, like me, you haggle on the price). However, you should have time in hand if you left Udon at 7:30 am or so.